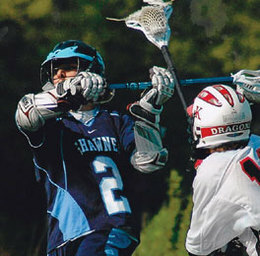 DJ Carruthers (pictured), a senior honor roll student at Shawnee High School, was invited to the Top 205 Lacrosse Camp, which brings the top lacrosse players in the nation together to compete. Carruthers also earned a spot on the Adidas National All-American Team. Ten-year-old Bells Elementary School student Laurel Cuccinello place third all-around in the United States of America Gymnastics New Jersey State Championship. Cuccinello competed against 38 level-five gymnasts in the beam, bars, vault and floor competitions, with a score of 37.250. Twelve-year-old Marlton Middle School student Taylor Styer took first place in the rings, vault, parallel bar, high bar and all-around at the level-six New Jersey state gymnastics competition. He also placed second in the pommel horse and fourth in floor exercise. Eighth-grade student Jesse Streb, captain of Marlton Middle School’s wrestling team, finished second at the South Jersey Middle School Wrestling League Tournament. He had 12 regular season victories, helping his team win their first-ever championship, and went 44-10 over his time at the middle school. Elise Hogan, a fourth-grade student at Haddonfield Friends School, won the silver medal at the level-five 2011 New Jersey state gymnastics championships on the uneven parallel bars and the balance beam. In the state’s 10-year-old junior division, Hogan finished fourth all-around. Three-year captain of the Lenape High School varsity bowling team, senior Anthony Scerati has been named to the Olympic Conference First Team All-Stars four years in a row and has bowled three perfect 300 games. Eastern Regional High School senior Robert Deutsch finished his wrestling season with a record of 42-0. He won his second state championship, having previously taken the title as a sophomore. With 155 career wins, Deutsch is tied for the South Jersey record. In the finals at the Battle of Fort Washington Lacrosse Tournament versus the Philadelphia Calvary, Moorestown fifth-grade gold team players Josh Fauvell, Dylan DeMarco and Kade Chrostowski each scored two goals, winning the game 12-3. Camden Catholic High School senior Addy Crenny finished the basketball season as one of the top scoring leaders in South Jersey. Crenny earned 428 points in 26 games, with a scoring average of 16.5. Eighth-grade Moorestown Quakes ice hockey players Brian Aji and Johnnie Yedman each scored two goals in the South Jersey Youth Hockey League Middle School “A” Championship game, versus the Shawnee Renegades. Winning the game 6-4, seventh-grade goalie Dominic Romeo and eighth-grade goalie Nick DeFrancisco held the Renegades to only four goals. At the 2011 New Jersey Kids State Wrestling Finals, eighth-grade Moorestown Quakers wrestler Tyreek Smith, a junior, won second place in his 189-pound weight class. Smith had a season record of 19-0. Eight-year-old Bells Elementary School student Amy Wang, an elite table tennis player at the national level, won the 9-and-under girls’ table tennis championship at the 2010 U.S. Open. She also took second place in the 11-and-under level.